Merry X-mas to you all and I hope that 2008 brings health and happiness to you casa! The X-mas music is drifting thru the house, the Santa collection is set out and the 18 inch artificial tree is standing tall on the back of the cocina counter. I even managed to put up one string of fifty multicolored lights around the edge of the cocina counter. 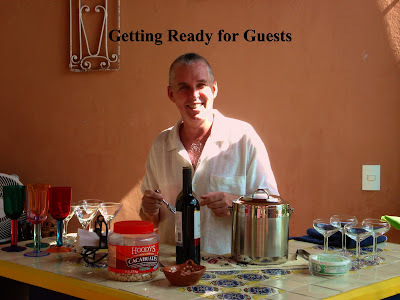 We’ve been to a few parties and one traditional Mexican Posada that Deb has written about in her blog. It is truly a festive time of year and once again I must say that we are so fortunate to have such good friends willing to share their lives and the Holidays with us. Last night our very good friends Lida and Diana stopped by with a X-mas cookie basket and a music cd. We seem to go in spurts in regards to seeing them. But the good thing is that when we do see them it is always fun and the time between visits just seem to fade away. They are extremely good people! Of course we presented a problem to them as we do not have up to date electronics and the cd was an MP3 cd and I’m not sure but I think we’re just a bit ahead of eight track! LOL! So we can’t play it so they are going to do another one that is compatible with our capabilities! We have been invited to our good friends Geo and Bebe’s to partake in their annual X-mas eve ham. As I have spoken in my blog previously you can’t go wrong going to Geo and Bebe’s for anything! Guaranteed good time! X-mas day we have been invited to Faye and Victor’s house, another “can’t go wrong with these good friends”. Faye just found a new seafood shop and has changed the feast menu to surf and turf! Yum! Yum! If you ever leave their house and are still hungry then you didn’t do something right. Excellent friendship and food! Now I must tell you that there is something that I do miss and will always miss being in the warmer climates. Night falls and a light snow starts, the X-mas lights are twinkling and dancing with the snowflakes and reflecting off the streets. Putting on a coat and hat and taking a walk with the quiet crunch of the snow compacting under you feet as you walk while that very silent sound of snow falling fills your senses. There is nothing else that can compare to that feeling of well being as the cold starts to penetrate and you turn to walk home where your loved ones are and their warmth is waiting to embrace you. This I do miss! Again Merry X-mas to you all and may the walk back to your house fill you with joy and happiness! What would Thanksgiving be without friends? A question to date I am happy to report that I cannot answer. I hope never to be able to answer that question! I am a very fortunate fellow! 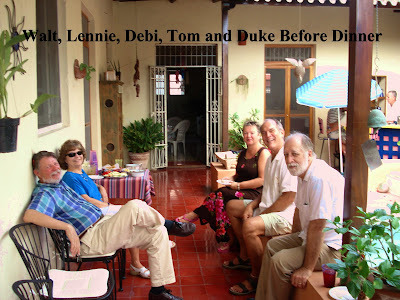 Debi and I were invited to our friends Geo and Bebe’s house along with some other friends. Geo and Bebe definitely fit the label, “Hostesses with the mostess”. Always a good time to be had when you go there. 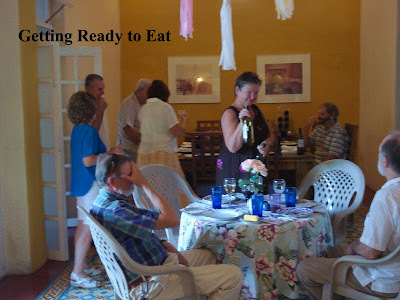 They supplied the main dish and all the pre-dinner snacks and drinks. Everyone brought an assigned dish so we were sure to have the whole meal deal! This is Geo at his bar on the terrazo at his casa. He is a superb bartender and you feel right at home everytime you belly up to the bar! Geo and Bebe's terrazo is very nice and we all gathered in that area chatting and catching up. And of course enjoying some of the mixoligists master pieces prior to the feast! Then it was time to get ready to eat and decide where to sit. There was also this fair maiden pouring vino for those so inclined. She's a cutie! 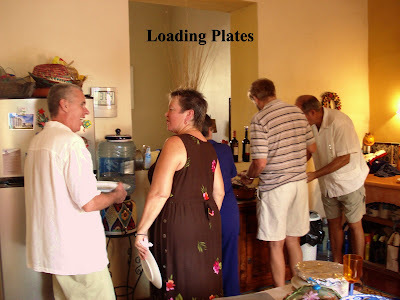 Next step is to load up your plate so get in line and load up the goodies! Yum! Yum! Always after the meal you sit and talk some more. Of course you can't move so why fight it! LOL! We hope that all of you had a great Thanksgiving with your friends as well! Our thanks to Jack and Beth Knepp for supplying the pictures. You hear about people getting it but after almost two years I was not even giving it any thought. 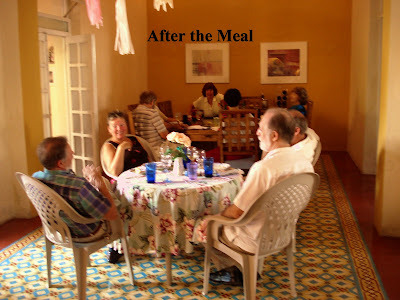 I knew that people say that it can be very debilitating and recovery can take weeks. I just hadn’t figured that I would ever get it. Surprise! What is life without a few surprises. It was fortunate that my session with Mr. Dengue was two days behind Deb’s. Not that we couldn’t have gotten friends to take her to the hospital but I think it’s good to have one family member on the up and up to make decisions. The speed in which it took over Debi was amazing. It supposedly takes an average of three to five days, once you are bit, for you to show symptoms. Only three hours passed from the onset of symptoms until Debi was in the ER! It was scary especially with her becoming delirious so fast due to the fever. My symptoms started differently and less violently. I started getting eye socket discomfort, headache, and some joint pain. It progressed from there but I never felt the need to seek medical attention. 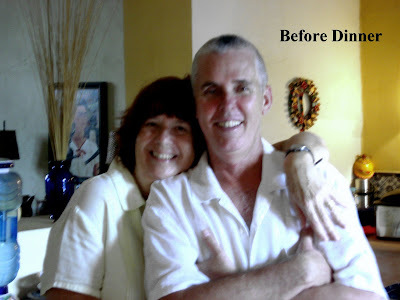 Of course knowing what Debi had and then getting the same symptoms did much for the diagnosis and ease of mind. The worst part for me was definitely the joint pain and the eye socket pain. The fever made things interesting with complete body flushes that made me feel as if I were a volcano and may explode. I did my best to counteract that by getting into the pool. Debi did not want to get in the pool as it was too chilly for her. I didn’t care because I knew that a temp of 103 had to be brought down. Friends checked on us, ran to the grocery store and brought food. We did not lack in support in any way. We are very fortunate people to have such good friends. Debi is at 99% now and I’m close behind her. My feeling is that of a car going down the road, I shift easily, seem to have decent power but I just can’t get into 4th gear. Our appetites are almost at normal. I can’t begin to tell you how wonderful it is not to have that metallic taste in my mouth, another aspect of dengue. Well, they say there are four types of dengue and once you have one type you can never get it again. That’s the good news! The not so good news is that if you get dengue again it is guaranteed to be worse. Not what I like to hear!